So I haven't spent all the days inside quilting, that I thought I may have done. 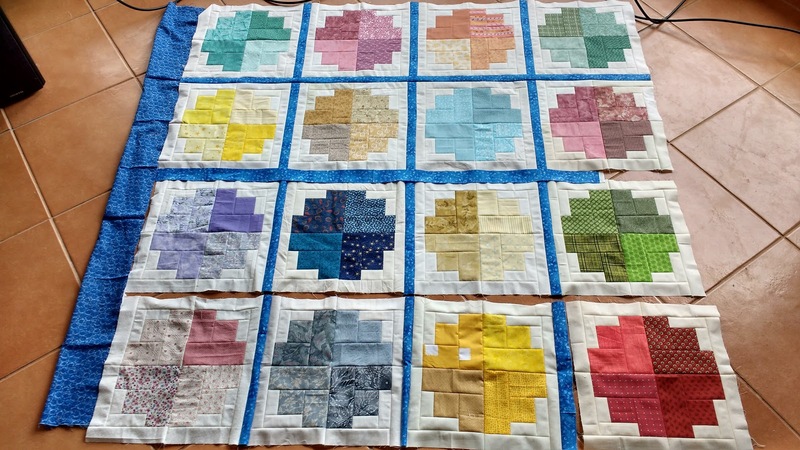 Having said that, I have managed to complete two quilts, the first for my mother-in-law. 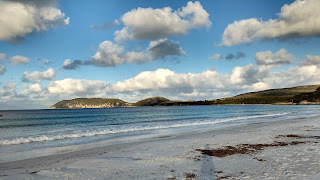 I had fun piecing this last time I came down to our holiday spot. Then I looked at the navy diamonds and figured out how I was going to quilt those. I wasn't quite sure about the white frames of the friendship stars though. I drew on some loopy shapes rather like a treble clef, but decided they looked too fussy. Then I decided to go with a simple curve that echoed what I'd done in the navy. I didn't realise until I'd begun quilting, that once I'd done 4 of the white sections they formed a circle around the navy - fortunate I thought. The curves also give the stars some movement, rather like wind turbines, which is fine by me. 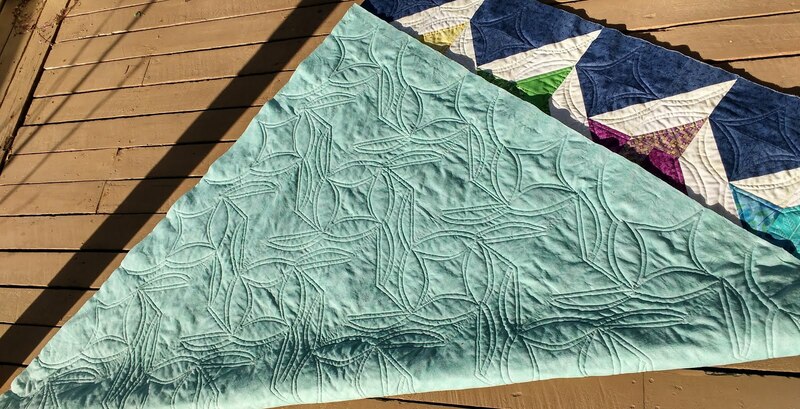 Here's the backing side of the quilt a simple pale turquoise that seems to fit quite well. Since I use my domestic machine, it's so lovely to have my sewing table that drops my machine down into a bit of a well so that the machine is flush with the top of the table. Then I put another table in front of that so that the quilt can spread out. That way I just do a little rolling in the throat space, but have plenty of space in front of me to take the weight of the quilt. Thread: Rasant on top; Superior on backing. 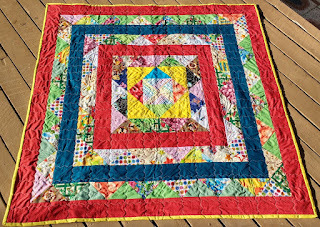 The second quilt was an easy half square triangle of eye spy fabrics combined with strong primary colours of yellow, red and blue. Since the mother to be (the intended recipient of the quilt) has a small boy around eighteen months, I thought he would enjoy playing a game of matching the triangles, while his younger sibling lays on the quilt - well at least that's the hope! Having done quite a bit of custom quilting on the previous quilt, I was very happy to just set my walking foot to a curved stitch and do the lines on this one. It shows up quite well on the backing which is just a soft fleece. Its very satisfying to complete a couple of projects. Now onto the next one and to solve the 'how shall I quilt this one?' question. 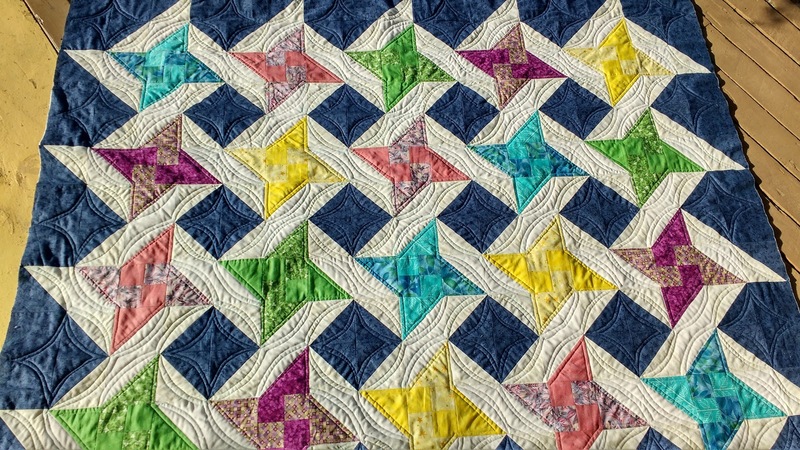 You hit on just the right quilting for the friendship stars quilt. 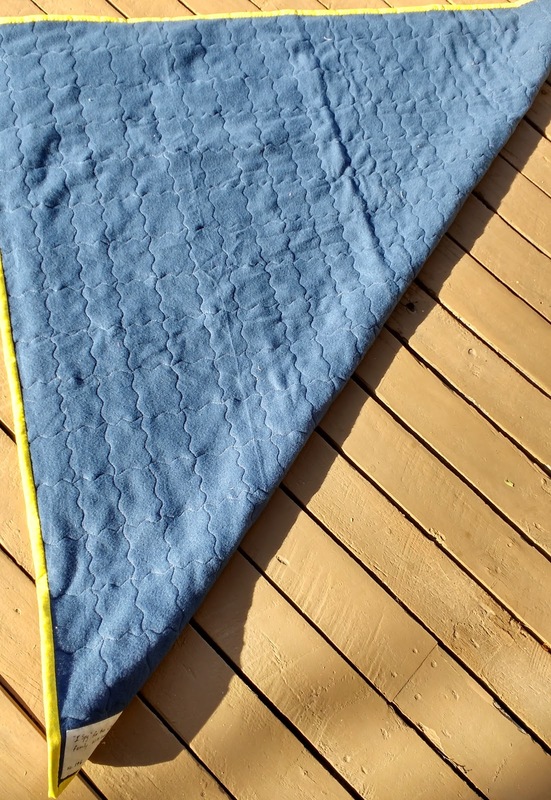 Did you freehand the arcs or do you have a quilting ruler? They look so perfect! 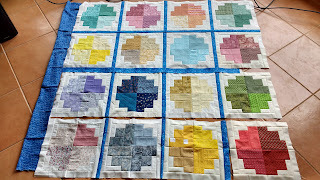 Very fun baby quilt too, and simple quilting works well there while giving you a break from the custom work! 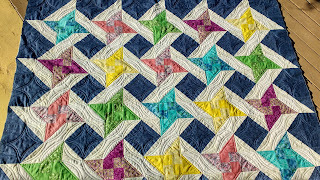 I love the quilting on the friendship star quilt, perfect for the design, and I love the sentiment of the second. 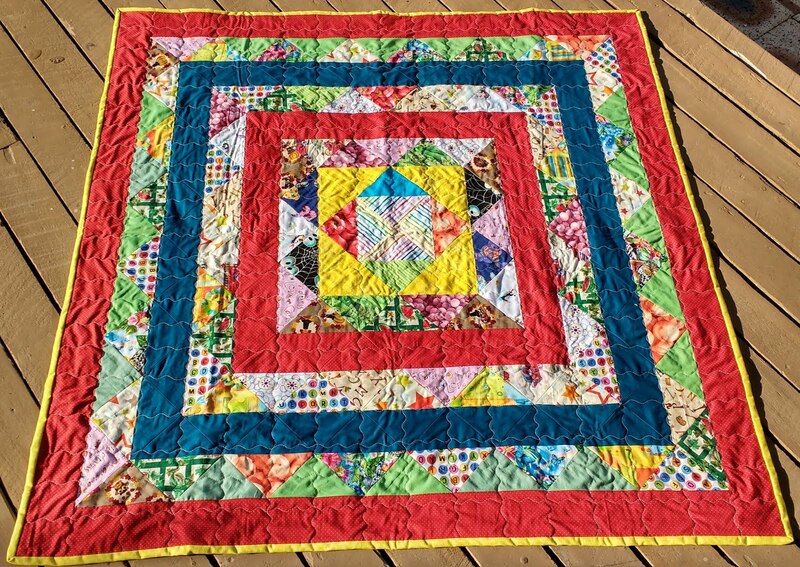 I believe that when you think about the recipient as you work on the quilt they fill it with your thoughts, hopes, and dreams. What a great idea to provide big brother with an activity as well! I need to remember that one! :) Thank you so much for sharing!